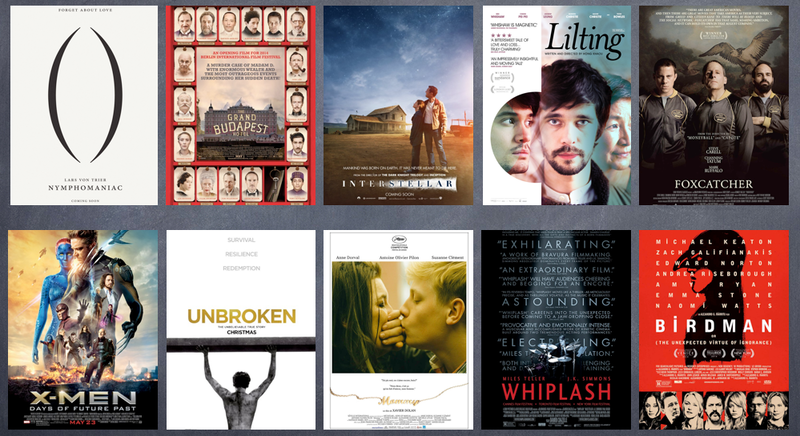 It’s that time of the year, where I get to write a blog post with a “Top 10” list of what I consider to be the best motion pictures of 2014. Last year was full of surprises. As I’ve been mentioning for the past couple years, my list consists of movies that I consider to be technically and artistically beautiful. These ten pictures have impacted me in different ways. They’ve scarred me, they’ve activated my brain in thought and philosophy, they’ve made me cry, they’ve made me laugh, they’ve challenged me; most importantly though, they opened my mind as a filmmaker, movie geek, and individual. The Film Journal International couldn’t be more right when it said, “Who needs 50 Shades of Grey when you have Lars Von Trier.” The provocateur offered me the most challenging movie to watch of 2014. It is raw, intense, mind bending, but most importantly, a rule breaker. Dalai Lama said, “Know the rules well so you can break them effectively,” and I can’t think of a quote that better fits this movie. From the fact that it’s divided in two volumes (Does that make my list a “Top 11” instead?) to his cast choice. From the storytelling done in chapters to the abrupt change in music style. This movie, which is for a limited audience, deserved to be on my Top 10 from the moment I saw both volumes earlier this year at the Nuart Theatre in Los Angeles. Here’s another film from early 2014 that breaks the rules and has a stamp signature by its director. This “moving painting,” as I like describing it, is quirky and beautiful to observe due to its hurricane of a cast, bold colors, art direction, and the composition of the shots. It feels effortless even though it is such an elaborate and grand piece of work. The soundtrack by Hans Zimmer is tremendous and Jessica Chastain once again proves why she is Hollywood’s “It” girl. She definitely got snubbed this awards season. I had the honor of watching this limited release independent film at Outfest Film Festival in Los Angeles. What a treat! 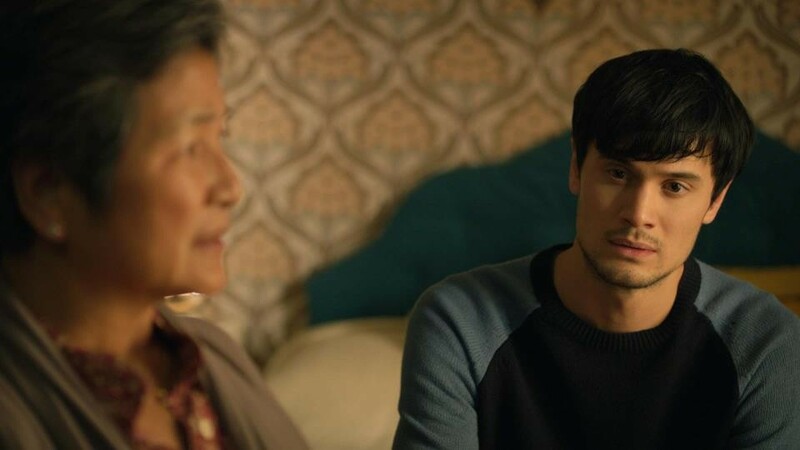 It’s a compelling story about a traditional Chinese mother (Pei-pei Cheng from Crouching Tiger, Hidden Dragon) who goes to Great Britain to pick up the belongings of her son who passed away, only to discover that he had been in a loving relationship of many years with another man. The language barrier between Cheng’s character and her son’s boyfriend, portrayed magnificently by Ben Wishaw (Cloud Atlas, my favorite of 2012) makes it much more interesting and there’s an amazing 360 shot that will require you to watch the movie if you don’t want me to spoil it! As a supporter of diversity in film, this had to be my movie with LGBT leading characters for my list. Sorry The Imitation Game! This very slow-paced movie won me over as it kept moving along in the middle of the second act and last act. Those last thirty minutes made it all worth it! Another project by the genius Megan Ellison that is cold, twisted, and heartless and gave me the ability to empathize with the main character, no matter how insane he was. I had been waiting for this movie since I watched the first X-Men movie fourteen years ago. This was the best treat for the child in me, to bring Bryan Singer back as a director, a big chunk of X-Men characters from past movies in a thrilling and adventurous movie that has soul and tones of social issues that are current in today’s world. Where else can you go watch a movie consisting of a cast with three Oscars, six Golden Globes, one BAFTA, two Emmys, two Tonys, five Oliviers, and one Cesar award? I had the opportunity to attend the LA premiere of this film at the Dolby Theatre and it was an unforgettable experience. This is a great example of why I appreciate historical pieces. I got introduced to a character I was not aware of, who was able to persevere, forgive, and live to tell his story besides the horrible atrocities of war, the shameful situations he was put in, and the obstacles he faced that determined whether he would live or not. Angelina and cinematographer Roger Deakins did an amazing job representing this person and the scenario he was put in. It’s a shame the movie was underrated and didn’t do well this awards season. A 25 year-old director envisioned this? My respects to Xavier Dolan for directing two strong female characters, a rebellious teenager with anger issues, and for breaking aspect ratio rules. Now I can see why he won the Jury Prize at Cannes. This film made me smile each time a song would come up. From Dido’s “White Flag,” to Alfil’s “Blue,” to “Wonderwall” by Oasis, this film was sort of like Boyhood on steroids. I’m so sad it didn’t get any love in the foreign language film. Whiplash was the most thrilling film I watched last year. I was on the edge of my seat most of the time! Who would think that a movie about a college drummer could create such reaction, right? J.K. Simmons and Miles Teller are terrific together, the way the music merges with the pace of the edit is outstanding, and the fact that it was shot in 19 days made have even more respect for the film. This is one of those movies you want to keep watching over and over again. If you know me well, don’t say anything before I clear my case. I know Iñárritu is my all-time favorite director, and no, that is not the reason why this monster was my favorite film of 2014. Birdman is so phenomenal that I don’t dare to write anything about it. It is genius! It destroys critics, Michael Bay movies, and YouTubers. So many things about it are true. I enjoyed the mix between real life, the play, and the mind of Riggan/Birdman. And of course, my respects to Chivo Lubezki for that amazingly choreographed cinematography.